My son, my 19M son, saw the belly coming out from the oven. He then rubbed his belly and said yum yum yum. Througout dinner, he kept on pointing to this dish and ate quite a few pieces. I roasted this when he was napping but before I was done, he was awake! Was so worried when I was transporting it to and from the table to baste and oven to roast. I didn't use Chinese wine to marinate this, instead I went with Rum. I like the smell of rum and how it mingles well with fruits... seriously smelling good while baking. The rum was a nice change. After I shot these pictures, I took a picture of this dish using my phone and and sent it to my hubby. He came home from work in high spirits saying he is famished and needs to eat right away! See me slicing the pork and asked me for one piece. One bite and he kept quiet. Later on, I didn't see him taking much of this. He still ate, just not that excited, and I asked him why? 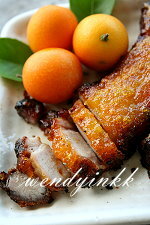 He said, I wrecked the Char Siew by putting lemon sauce. I told him, this is not char siew! LOL. The pork looks charred but they don't taste bitter, I like it this way, and it's not an excuse. 1. 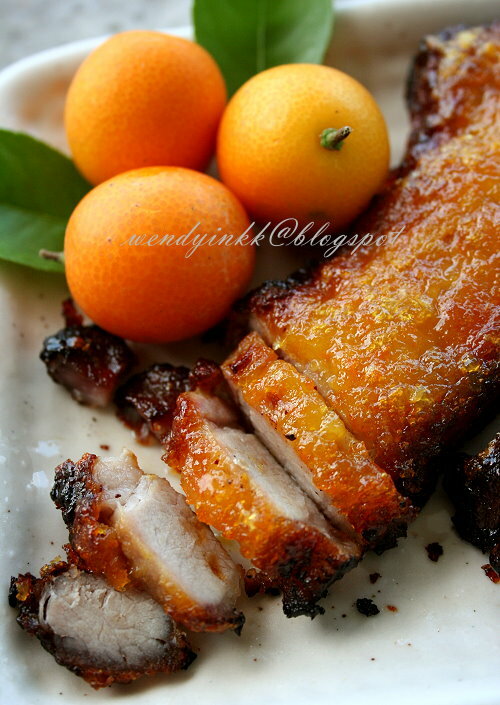 Marinate the pork belly with salt, %-spice powder, sugar, pepper and rum for a few hours. 2. Half kumquats and remove seeds. Cut into smaller pieces. 3. Put kumquats, ginger and sugar into a small saucepan, add enough water to cover and let it simmer for about 30 minutes until the kumquats look translucent. Blend everything until fine and cook until it forms a thick sauce. 4. 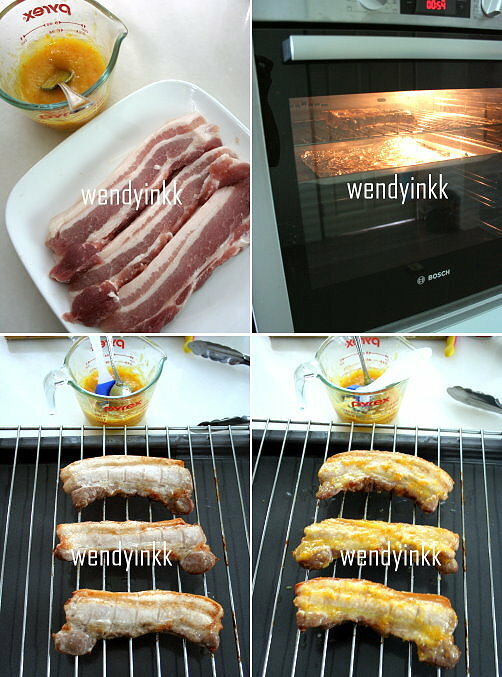 Remove belly from fridge and grill in 220C for 15 minutes, turning once halfway. 5. Remove from oven and flip the belly. 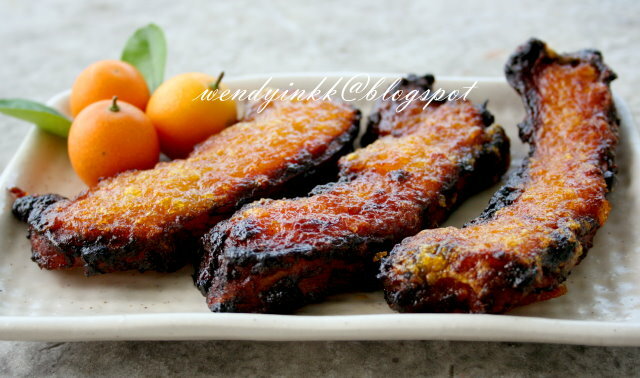 Brush a thick layer of kumquat sauce over(surface facing up only, plus the sides) and let it grill for 10 minutes. 6. Remove from oven and flip the belly. Brush more sauce over (this surface was without sauce earlier) and then grill for another 10 minutes. put more sauce than what I showed! Muah! Muah! Muah! Wendy, I came over straight away when I saw this on my sidebar. 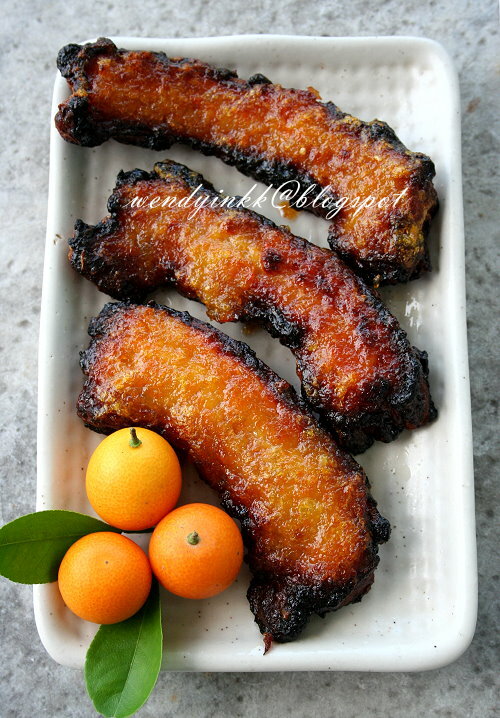 I actually like the charred parts, ada oommph! I must go look for kumquats this weekend. 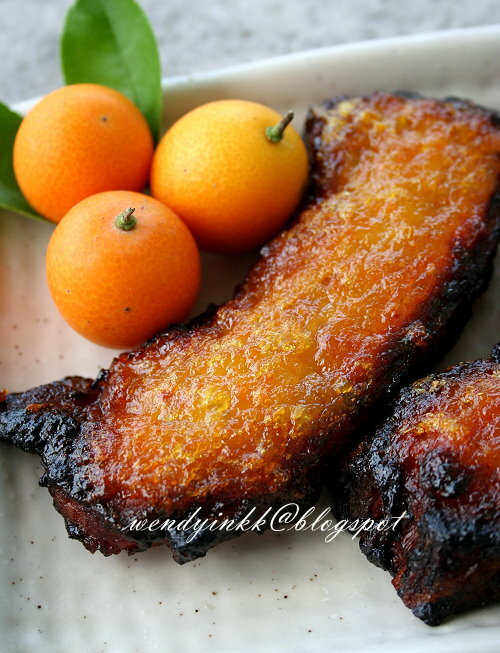 Are you submitting this to Sonia's CNY Delights? wendy , thanks for your reply .